He studied carving and sculpture while he was student. After graduation, he studied under his father, Toshu Yamamoto who was a Living National Treasure. When he became independent, he pursued the possibilities of the 'clay', and invented techniques called 'Tatakikomi' and 'Shussai' (patted colored clay onto pottery). 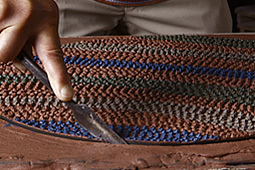 When he discovered the clay from Bourgogne, France, he established a style of novel and unconventional form of pottery, called 'Tsumiage', a technique of piling up plated clay. 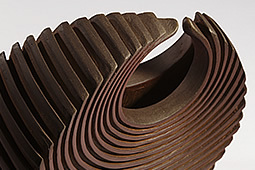 His work is based on the inherited Bizen pottery, though he adopts new ideas onto the tradition. He still is an active potter. 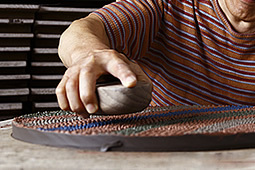 Izuru Yamamoto's two sons (Shusaku, Ryosaku) succeed his father's technique and adopt new ideas with their own sensibility and they are expected to be a part of the next generation of Bizen potters. Born as the fourth son of Toshu Yamamoto who was a Living National Treasure. Graduated from Musashino Art University, TokyoDepartment of sculpting. Graduated from Musashino Art University, Tokyo Department of specialized sculpting. studied and lived there for 2 years. After the return from abroad, started to study pottery under his own father who was a Living National Treasure of Bizen ware. Became an independent potter and made his own kiln in Imbe, Okayama and started to establish his unique technique of 'Tatakikomi' (patting the pottery in a unique way). Collaborated with Serge Fribault, a chef of Lenotre and held an event, 'Eat French' using his pottery in Tokyo. Received a prize at the 27th Exhibition of Japan Kogei Association for the piece, 'Bizen Tatakikomi Baimon Obachi' (pattern of Japanese plum blossoms on a large bowl). Became a member of Okayama Kenten (prefectural art association). Established his own technique, 'Shussai' (colorings). Received a prize at The China and Japan International Pottery Exhibition for his 'Bizen Clay Shussai Obachi'. Invited to exhibit 'Bizen Tatakikomi Kurobara (black rose) Obachi' and 'Bizen Tatakikomi Baimon Obachi' at the Japanese Modern Pottery Exhibitions in The Smithsonian Museum, Washington, USA, and The Victoria and Albert Museum, London, UK. Invited to exhibit the awarded 'Bizen Tatamikomi Baimon Obachi' at The 30th Anniversary Exhibition of The Japan Kogei Association. 'Bizen Clay Shussai Obachi' received The Kaneshige Toyo Award from the Japan Kogei Association of the Chugoku area. Received a prize from the Japan Kogei Association. 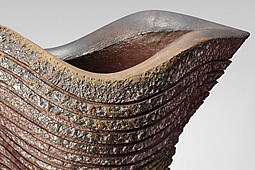 'Bizen Yohen Hanaire' (a flower vase with kiln effects) was housed at The Brooklyn Museum, USA. 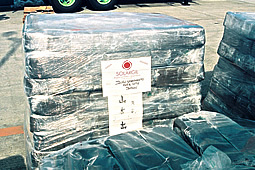 The Japan Foundation bought 'Bizen Clay Shussai Obachi'. Established the technique 'Tsumiage' (piling plated clays). Exhibited at 'Modern and Ancient Pottery, Discovery of Clay' of The Shigaraki Ceramic Cultural Park. Became a judge of The Japan Kogei Association of Chugoku Area. Received the Grand Prize for 'Bizen Clay Tsumiage Shussai Tsubakimon Hanaire' (Camellia Patterned Flower Vase done in the Tsumiage Shussai style). Invited by Kenten (prefectural exhibition). 'Bizen Tsumiage Kaki (flower vase)' was selected at The Japan Kogei Association Exhibition. Discovered the clay of Bourgogne. Became a panel of judges for NHK (Japan Broadcasting Corporation), Chugoku area. Worked at a castle in Yonne, Bourgogne, France. NHK satellite TV broadcasted his work in Bourgogne. Tenmaya department store, Japan (17th Oct-21st Oct). Received the Okayama Prefectural Culture Award. Invited to exhibit 'Tsumiage Kaki', at 'Tradition of 1000 Years of Bizen Pottery at the Musee National de Ceramique, held by Sanyo Shimbun (Sanyo Newspaper). Invited to exhibit 'The Return of Bizen Pottery' in Tokyo, Hiroshima, and Okayama held by the Sanyo Shimbun Company. Higashi Hiroshima City Museum bought 'Tsumiage Kaki'. Invited to exhibit in Bandol, Provence, France and invited for potters exchange meeting and forum as a lecturer. Dedicated 'Houyou' (Embrace) to Ise Shrine. Received the 64th Sanyo Shinbun (cultural effort) award. Received an award at the 2nd Kikuchi biennale with tsumiage flower vase, 'Hoyo' (W56.8xD42.5xH68.2cm) made with clays of Bizen and Bourgogne. The National Museum of Modern Art, Tokyo housed 'Bizen Tatakikomi Baimon Obachi'. Acknowledged as Okayama Prefectural Living Treasure. 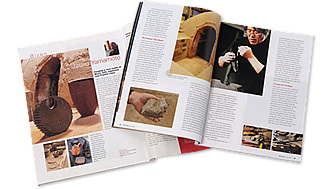 Kodan-sha 9th edition of'Modern Japanese Potteries'. Yonne, Bourgogne newspaper, with the work at a castle. NHK BS1 (satellite TV) broadcasted 'Bizen to Bourgogne - Challenge of a potter'. 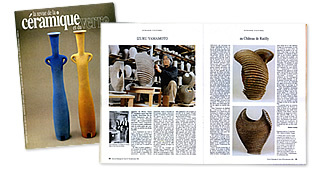 French pottery magazine 'Ceramique' of July. NHK BS2 broadcasted 'Form of Hoyo, Izuru Yamamoto'. ANA magazine 'Tsubasa no Okoku'. Piling plates of clay, mixed with Bizen and Bourgogne. Kneading pigment into the clay and put onto the body of work. 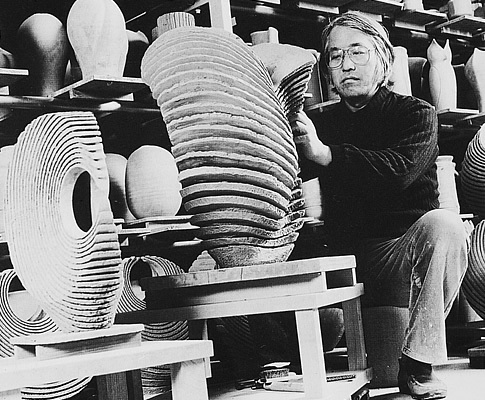 Izuru Yamamoto discovered the clay of Bourgogne. It contains ingredients 'kaolin' similar to Bizen clay. It is smooth and it does not shrink less than Bizen clay when it is baked. Mix of Bizen and Bourgogne clays enabled to establish the technique of Tsumiage. 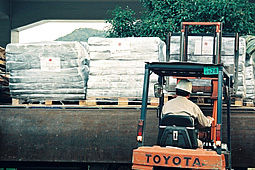 The advantage of the mix of clays carry the tradition with the smooth surface of the work. Contact us by email about the work of Izuru Yamamoto.